This section describes the code generated for tables using different storage models. Firstly, it is required to know how the data of a table are stored in the agent. The data given in tables can be stored in two formats, either in Agent Table Model or in Your Own Storage Model. For every row in the table, an xxxEntry object gets created. The xxxEntry object stores the values of all the columns of that single row. This xxxEntry object has getter and setter methods for getting and setting the value of a particular column. It also stores the instance OID of the row as an int array. Instance OID is nothing but the index value of a table that identifies a particular row. All the xxxEntry objects are then put into an AgentTableModel. The ' AgentTableModel ' internally stores all the xxxEntry objects in a vector sorted by their instance. 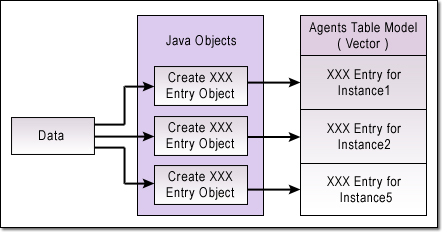 The figure given below illustrates how the data are stored in AgentTableModel. The Request Handler file has the following lines generated for a table. The following method is called. This would return the xxxEntry corresponding to the specified instance. The following method is called. This would return the xxxEntry corresponding to the first row (instance oid) in the table. To get the xxxEntry corresponding to the instance oid immediately after the specified instance oid (inst), the following method is called. A new instance of the xxxEntry object is to be created. The values of other columns are also set in the xxxEntry object by calling the respective setter methods. The above created xxxEntry object is added to the AgentTableModel. The 4 steps given above are repeated for all the rows in the Table. A row is added to the Agent Table Model by calling this method. Sometimes, you may prefer to have other storage mechanisms than using the default Agent Table Model. Agent Toolkit also provides an option to implement your own storage model. To acheive this, storage model for tables can be selected as "User Storage". Select Project->Settings from menu bar. The Settings dialog will pop up. Select Source Generation-> Storage Model node from the tree in the left frame of the Settings dialog. To select User Storage Model for tables, select 'User Storage' option from the combo box. To select the option for individual tables, select the corresponding table from the list in right panel and choose 'User Storage' option from the combo-box provided. This generates a XXXTableModelListener class for each table selected using the User Storage option. This class implements the com.adventnet.utils.agent.TableModelListenerExt interface. All the methods that you want to instrument will be listed in this generated file. You can plug-in your implementation here. If 'User Storage' is used for tables, then in the generated agent code (like XXXRequestHandler class), XXXTableModelListener instance will be used instead of the Agent Table Model instance. This method gets called when there is a GET request for the table. The request is sent with the instance oid and on identifying the instance, the value is returned for that entry. If no such instance exists or for an invalid entry, a NULL value is returned. This method gets called when there is a get next request for an instance oid value. In that case the agent searches for the next immediate instance and returns the value of that instance. A NULL value is returned if no such instance exists. This method gets called when there is a getnext request for the table without any instance oid. This method gets called when there is a SET request that adds a new row to the table, which has the row status. This method gets called when you want to set the table vector elements. This method gets called when you want to get the vector entry objects. Any Table is initialized with the default values provided on Agent start-up. The default values for a Table do not get generated unless the "Initialize with Default Values" is checked in the MIB Compiler UI. (Project -> Settings menu -> General Category). Instead of having the default values, if you prefer your Agent to be started with a Table holding the values you require, the following methods can be utilized. But please note when you instrument the code for the Tables to have specific values, the Agent should be restarted for the changes to take effect. To create a row in the Table, the following methods can be used. Using this method will add an entry to the Table with the Instance. The method takes all the column values and its instances as inputs and creates the row. The method name and the parameters used will differ according to the Tables used. For example : The code for creating and adding a new entry in the AapplicationTable of AGENT-SAMPLE-MIB is given below. This code should be included in the initSnmpExtension Nodes generated in the Main file. This method is used to create a new entry to the table without specifying the instance. It accepts all the column values as inputs. To create an instance the createInstance method is called. When the instance value is created and the values for the columns exist, the createandAddEntry method is called. This creates a new entry in the Table. This method is used for creating an instance for a Table by taking the index values as inputs. Once the instance is defined, they are given as inputs along with the columnar values and used for creating an entry. For example : The code for creating an instance in the AapplicationTable of AGENT-SAMPLE-MIB is given below. This method gets generated by default in the AapplicationTableRequestHandler file. The Vector contains elements of xxxEntry type. //Here the entry is created newly. //in the Agent Main File. These codes have to be added in the initSnmpExtensionNodes method of the Agent Main file. Any Table should have an Index column defined in it. Each row of a Table is identified by its index value. There are various types of Indexing and this topic provides the details of the supported syntax types in indexes and the types of Indexing. An Index of a Table may belong to the category of : Single Index, Multiple Index, Implied Index or External Index. To know what exactly each index means and how they can be defined in the MIB , please refer to Adding a Table topic in Defining a MB section. For any Table, the resolve Index method is called. All the SET requests for the Table reaches the Resolve Index method wherein the requests from the Manager are first checked whether such an Instance exists. If a matching instance does not exist then an error is thrown or a new entry is created. The code for resolving index resolves the value of the indices from the instance oid given. When it comes to a Table having Multiple Index, the code is generated in the same manner. The only change in Multiple Index is that while resolving the Index, the instance and its syntax type are verified. In this code, the agentName is the reference of the SNMP Agent Main file generated for the MIB and the indexVar is the value of the external index from the request Varbind. Based on the instance type, the index is resolved. If the index value is null or if no such instance exists, an error is thrown after resolving the index. If isImplied is set to "false", then the Index is resolved taking into consideration the length of the instance. If set to "true", then it is handled in the manner as any Table that has multiple Index columns is handled. For better understanding of all indexes please go through the example available in <Agent Toolkit Home>/examples/snmp/tablehandling/tables directory. The information in readme.html will help you run the example.